Does your website get traffic but very few messages or conversions? Take a detailed look at your online lead generation form to help your website capture more leads. Website visitors are notoriously fickle. Tiny attention spans and the conviction that a better product is only a Google search away, means that the challenge is no longer getting traffic to your site. Instead, the downfall of many websites is turning that traffic into leads that generate sales. Your primary lead generation tool is an expertly crafted online lead form. Done right, these forms can convert 5-6% of visitors. Some specialist forms convert in excess of 20%. But a few simple mistakes and that figure will drop below 0.1%. In this post, I want to concentrate more on how to present the completed form. The actual form build should be relatively simple, but how it is displayed makes a huge difference! What is a lead generation form? In its most basic format, a lead form can be as simple as an email sign up form, collecting just an email address and a name. Often a lead capture form will collect a little more information for lead capture, though it should still be kept as simple as possible. Use a different form on each page to get a little extra information without extra fields. For example, by knowing the page the form was sent from, you'll know if a user is interested in your home, business, or corporate offerings. Make the form purpose clear in your form design and avoid identical forms on every page. If you decide to add extra fields to your forms, only include questions applicable to that page. This will keep the user experience simple and streamlined. You have probably read lots of articles recommending above-the-fold placement of important forms. Since the most visible location will produce the most response, this is a good rule of thumb. But it is not set in stone. The marketing concept of AIDA (Attention, Interest, Desire, Action) states that before a visitor makes a decision to take an action, they must be directed through a series of steps to grab their attention and their interest. Following that logic, your lead generation forms should be the last step on your page! Interestingly, when following AIDA principles, lead capture rates for slightly longer forms can increase dramatically. Users are willing to enter more information when they already have a real interest in this subject. If your lead form absolutely can't be simplified any further, but is still above the 4 field recommended maximum, this approach may be worth investigating further. **Pro tip** Before you abandon all your previous form positions and move everything to the bottom of your content, read the bonus tip below! While spam protection is important, nothing hurts conversion rates as badly as complex captchas. You know the ones - they require you to type in text from illegible, distorted images, figure the square root of a Labrador puppy, and submit to DNA testing. OK, so it might not actually be that bad. But spam protection that impacts the user experience dramatically reduces conversion rates. All Formidable forms now have HoneyPot spam protection built in automatically. If you have other security on your website you may not need a captcha at all. If you can't live without captcha protection on your form, you'll be happy to hear that Formidable now supports invisible reCaptcha, so the user experience is impacted less often. The invisible reCaptcha may require image verification after submitting the form for suspicious submissions, but will go unseen by most visitors. Tip 4 - Never "Submit" on submit button labels! The text on your form's submit button is a small detail that can have a big impact. Using the dreaded word “Submit” as your form call to action reduces conversion rates by around 3%! Trials have shown that the most compelling text options for the button include “Click Here”, “Go”, “Download” or “Register.” Consider different options for specific forms. Don’t be afraid make the button HUGE, and give it an eye-catching, positive color. Does your form stand out? Placing it inside a container with a different background color can be a great, eye-catching visual cue and draw users to it. Also, it implies that the elements inside the box are part of the same group, and separate from the page elements surrounding it. This helps users to instantly distinguish between the form and non-form elements on the page. Visual cues to direct users to the lead form can also be an effective way to increase conversion rates. Especially if your form is below the fold. While styles and methods for this will vary depending on the design of your site, it doesn't need to be complex to work. 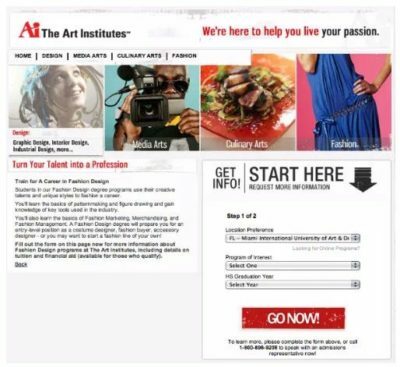 The Art Institutes website uses a simple black & white text design with a supersized arrow pointing towards the form. It is an unmissable visual cue, but one that does not detract from the main page content. Read more about WordPress form design to increase user engagement. Bonus Tip - Embrace your unique! Every website and every target audience is unique, so never rely 100% on "what works for everyone else." Test it yourself and see. Take note of your conversion rates for each form, and review the data on a regular basis. Test different positions on the page and compare the figures to the previous month. Research and test what works best for your unique setup. I recently discovered a FREE add-on from a 3rd party developer which adds A/B testing abilities to Formidable. I'm planning to try this out on some of my own forms in the near future! A/B testing allows you to to test your ideas and compare results. 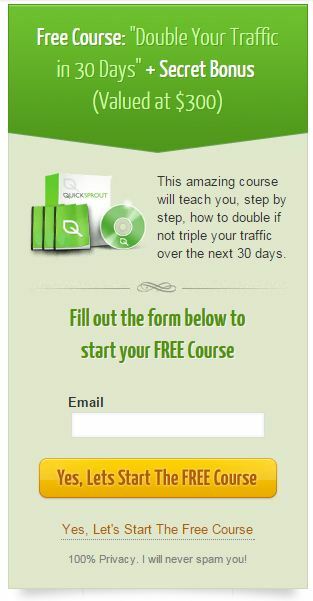 It is a fantastic tool for maximizing the potential of your online lead generation forms. So what are you waiting for? Make your lead generation forms Formidable today!